So if you read my blog you know that I have a share in a local farm (see CSA ~ Community Supported Agriculture). I am splitting my share with a friend, with whom I alternate weeks. This week was my week, and I got my first bunch of beets. This will be the first of many. This weeks beets are a mix of the traditional deep red beets (Detroit Dark Red) that most people are familiar with and some yellow beets (Golden Beets) that, unlike the classic red variety, don’t bleed. Last year we also got some Chioggia, which are a very pretty red and white striped beet. While I would expect that most people are familiar with beets, many people do not include them in their diet, which is a shame. Beets are a low-calorie source of vitamin C, folate, potassium and manganese. Five ounces of beets provides 13 grams of carbohydrates (4 grams of fiber, 13 grams of sugar) and 2 grams of protein, and weighs in at a measly 58 calories. And don’t throw out the beet greens ~ 1 oz of greens provides 1 gram of protein, 2 grams of carbohydrates (1 gram fiber), lots of vitamins A, K and C, in addition to calcium and iron. I think a lot of people struggle because they don’t know what to do with beets, aside from the traditional roasting of them. I am here to help you. Last year, as the plethora of beets started to tumble forth from the earth at the Dover Farm, I went to my tried and true resource, The New York Times. I have referenced recipes from the NYT’s “Recipes for Health” in the past. Some of my favorite recipes come from this source. Today I am sharing a recipe published in 2009 called Farro Salad with Beets, Beet Greens and Feta. I love this recipe because it makes a nice side salad with a piece of grilled chicken, or it can stand on its own as a vegetarian dish. I also love that it uses both the beets and the beet greens. As you can see from the photo, it looks really pretty, and it tastes as good as it looks. 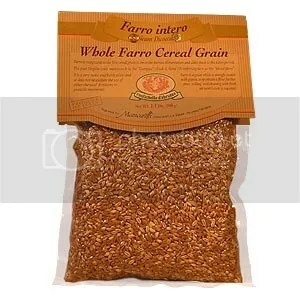 If you aren’t familiar with the farro called for in the recipe, it is an ancient grain, traditionally grown in Italy. The definition of what is “farro” can vary, so you want to look for “triticum dicoccum.” I have found this at Whole Foods. It is not cheap…the last time I bought it it was $9 for a pound. If you can’t find it or don’t want to spend the money, you can try substituting barley. The farro will provide fiber, protein and some iron. Add the feta cheese (more protein and some fat) and the walnuts (healthy fat, protein, iron, and a host of vitamins and minerals) and you have not only a satisfying salad, but a healthy one. I have made a few tweaks to the NYT recipe ~ I increase the balsamic vinegar from 1 teaspoon to 2 and I use 3 T of olive oil and 2 T of walnut oil in place of the 1/2 cup of olive oil. For the herbs I tend to use chives and a lot of mint. I love the taste of mint, and I think it lends a really fresh flavor to the salad. If you’re wondering how to roast the beets, simply preheat your oven to 425 degrees. Cut off the greens, leaving some of the stem on the beets. I also chop off the ends. Scrub them well (especially if they are coming from a local farm ~ they will be dirty) and place them in a casserole or baking dish with a tight-fitting lid. Add a small amount of water and roast, generally for 30-45 minutes, depending on the size of the beets. You can tell when they are done by piercing them with a fork ~ the fork should go in easily. Let them cool slightly, then peel off the outer skin (it slips off easier if the beets are still warm). So, my beets are roasting in the oven right now, the farro is soaking and I am going to blanch the beet greens once I get this post published. I should have farro salad with beets in time for lunch. Give it a try and let me know what you think! Happy eating! This entry was posted in Nutrition and tagged beet greens, Beets, Community Supported Agriculture. Bookmark the permalink. hMM. This does look good and I do struggle with beets. For us, they’re a winter veg so I’ll bookmark until December or so. Thanks for sharing.